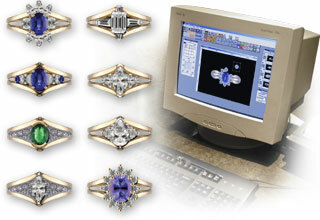 Digital Goldsmith 2D design software enables us to demonstrate instantly, in color and in scale, alterations and variations to designs, metal colors, stone choices in graphically real detail without painstaking assumptions and risky gambles. With three digital jewelry cameras attached, and 2 operating Digital goldsmith machines in-house, we can accurately portray design ideas and ensure the shop and design team are executing the ring or piece you want. Stop in today to see how Digital Goldsmith has become indispensable to the design effort and is the stepping stone to full CAD/CAM Matrix systems for manufacture.